If you’re a director, actor or playwright, Director’s Cut Theatre Company are on the look out for new blood (see below for latest call). They’re utterly professional, command healthy audiences and are a pleasure to work with, as I discovered when my 10 minute play, Pig in a Blanket, was performed at The Pleasance Theatre, Islington, earlier this year. It was part of a showcase of nine new plays – No U-Turn! – based around the theme of people trapped in traffic. Ironic, as it turns out, because on performance night, north London was plunged into havoc by engineering works and a defunct Picadilly Line. Despite this, more than a hundred people managed to get through to see the show. Artistic Director (Heather Ward) and Dramaturg (Jessica Mayne) selected plays by Claire Booker, Mitch Day, Clare Knights, Callum McGowan, Michael Pearcy, Nikki Racklin, Julian Ross Davison, Julian Warren and James Withey from nearly 200 submitted to a very specific brief. We had to create up to four characters stuck in traffic, unable to leave their cars, with a specific place they were heading to. At the end of each play, the traffic had to move on, yet we weren’t allowed to reveal what had caused the jam. A total of 16 actors and 9 directors set to work turning our words into theatre, including specially created choreography to link each of the nine plays. A big thank you to Rosie Ward and Lauren Orrock for their finely crafted performances as ‘Rat’ and Ellie (animal rights activists with a nasty secret in the boot) in Pig in a Blanket. I had great fun at the first rehearsal watching them go through improvisation exercises with co-directors Kieran Rogers and Peter Gould, including revisiting Rat and Ellie’s childhood haunts and a pretty hard-nosed police interrogation. The next showcase Drafts is coming up on 29th May at Southwark Playhouse for which writers’ submissions have just opened. They’ll be casting next month. Twelve actors, ten playwrights, one great concept! 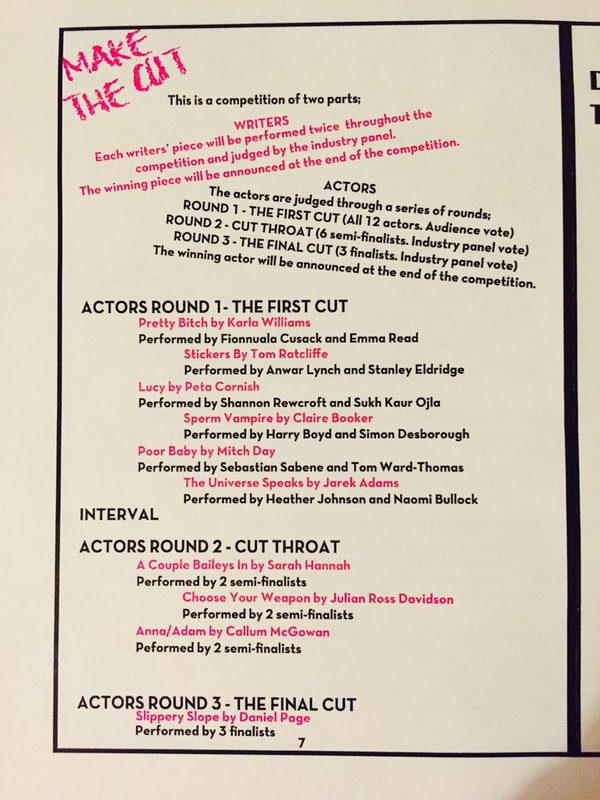 Director’s Cut pulled off an adventurous evening of acting and writing talent on Tuesday, with its ‘Make The Cut’ slam at London’s prestigious St James Theatre. It’s always a privilege to have a play performed by up and coming young actors. This time, not one, but two, got to interpret the role of Kips in my play ‘Sperm Vampire’ along with nine other monologues, also performed by more than one actor. The monologues were selected from among hundreds submitted to the company. Each play was performed twice, by two different actors. Each actor got to learn three different monologues. 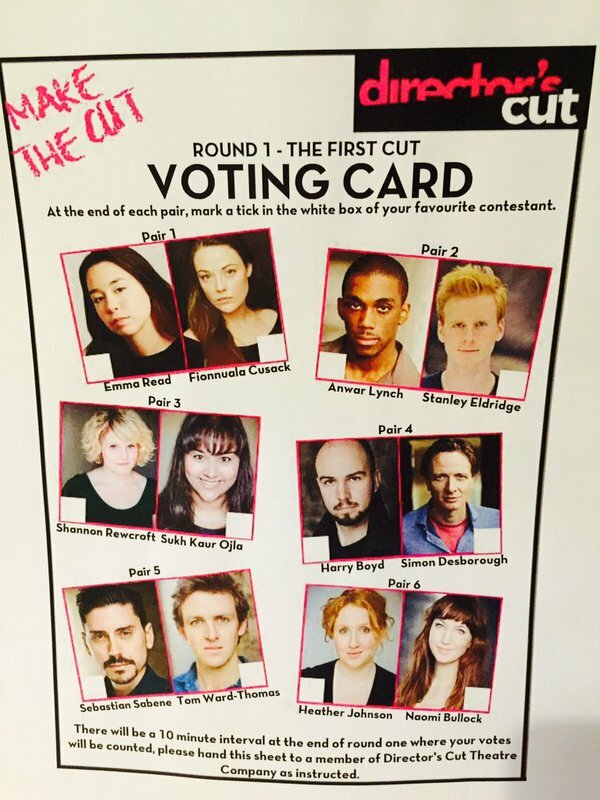 The first round comprised all 12 actors going head to head in pairs, performing six of the shortlisted plays. The audience then got to vote who went forward. The six winning actors then went head to head in three groups of pairs, performing a new monologue. The final round saw three actors performing the final monologue. Simon Desborough and Harry Boyd both gave sterling performances as Kips in ‘Sperm Vampire’ by Claire Booker. A big thank you and congratulations to them both for their excellent interpretations. Congratulations also to all the short-listed writers, the other ten actors and mazeltoff to the ultimate winners, actor Sukh Kaur Ojla and writer Tom Ratcliffe.